Designing a dining zone is not that easy, especially when you want it to be functional, comfortable and stylish at the same time. At first sight it may seem to be quite challenging and requiring special knowledge and expertise. But actually to make a stylish and beautiful dining area in your home, all you need is to choose one of the 7 win-win options. Here they are! This can be a banquette built in the wall. Or a low windowsill seat upholstered with soft fabric. 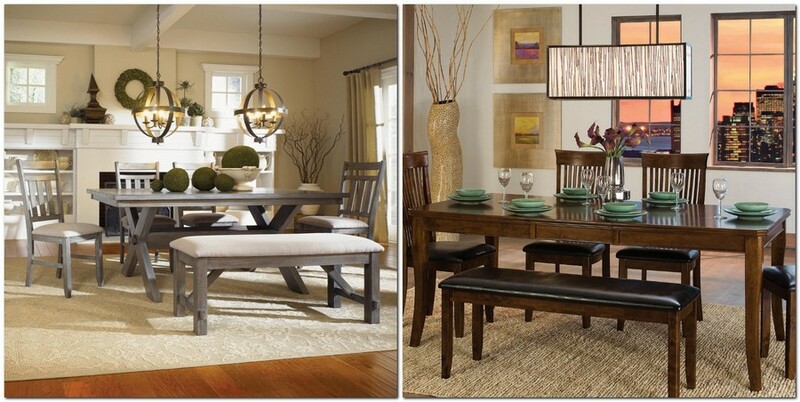 A nice option is putting two matching banquettes opposite each other with a rectangular table in the middle. Though, such furniture arrangement requires a non-standard kitchen layout. So, if you are a lucky owner of such a room, feel free to use this tip. Surprisingly, long benches look more original and contemporary than conventional dining chairs. You may opt for plain wooden ones or more comfortable variants – upholstered or complemented with soft cushions. By the way a long 3-seat bench takes less place than 3 chairs. And it can also be pushed under the table, which is important for limited spaces. 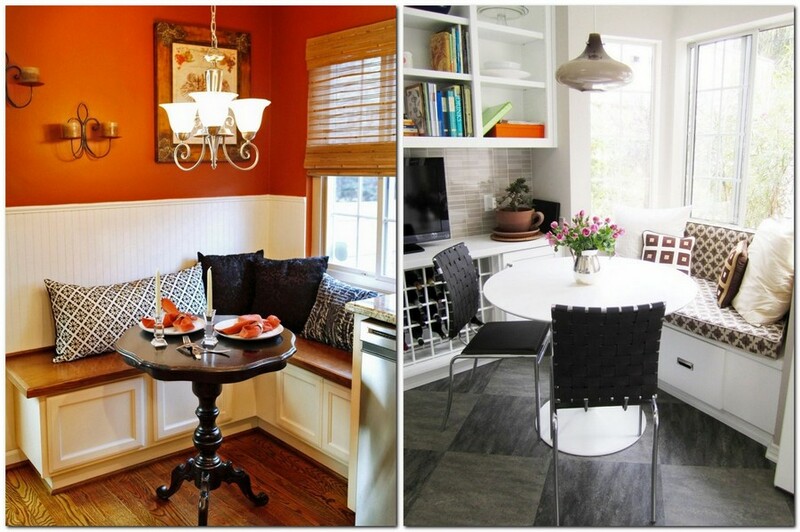 If your dining zone is organized in the kitchen, you may save space by means of stools. They’re also better than chairs in terms of compactness. Let’s not forget that color contrasts are a nice designer trick for accentuating definite areas. And a dining room is not an exception. For example, a very popular interior solution is to complement a light, even white table with red metal or plastic chairs. Here it’s a matter of your choice and home interior style. And if you like the idea of red dining chairs, read our previous post about this trend. A compact round dining table is a great space-saving solution – it’s always better than a rectangular or square one. 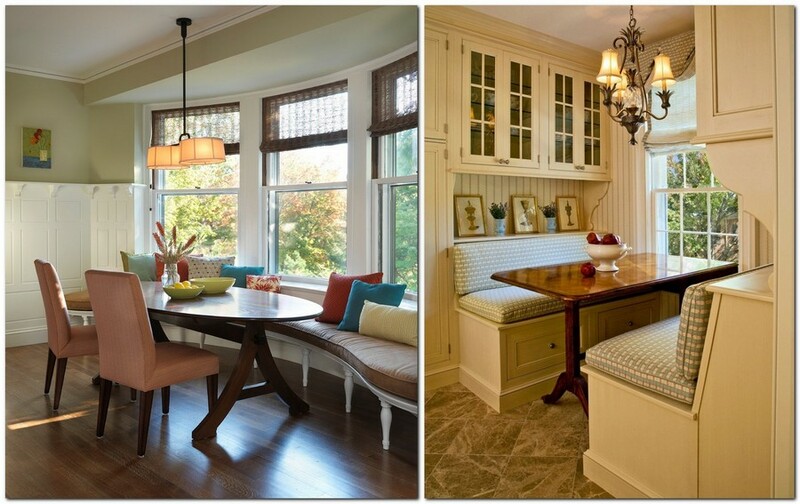 And coupled with an L-shaped banquette, it eliminates the need to put chairs. And when guests come, you can always bring extra seats from an adjacent room. 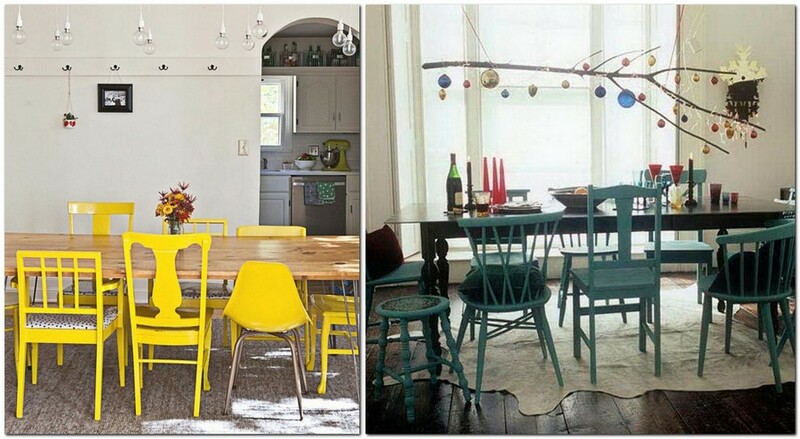 Mismatched dining chairs are not just acceptable, but even recommendable. 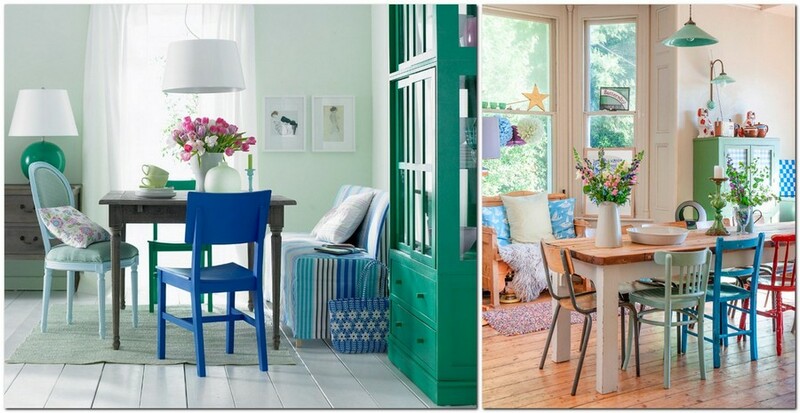 A set of different chairs will surely make you dining zone bright and one-of-a-kind. And if you paint them differently, it will be even more eye-catchy. One of the golden rules of stylish interiors is to mix pieces of furniture of different heights. And it’s also true for dining rooms. 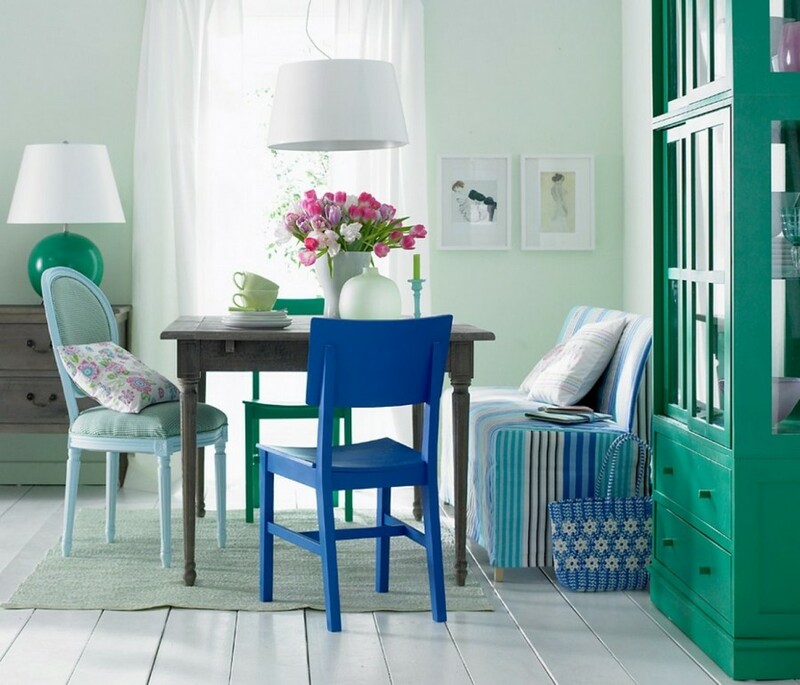 By mixing taller and lower chairs, you’ll get a wonderful effect that will cheer you up every time you come to have a meal. Have you ever thought about having dining seats that would be non-standard? 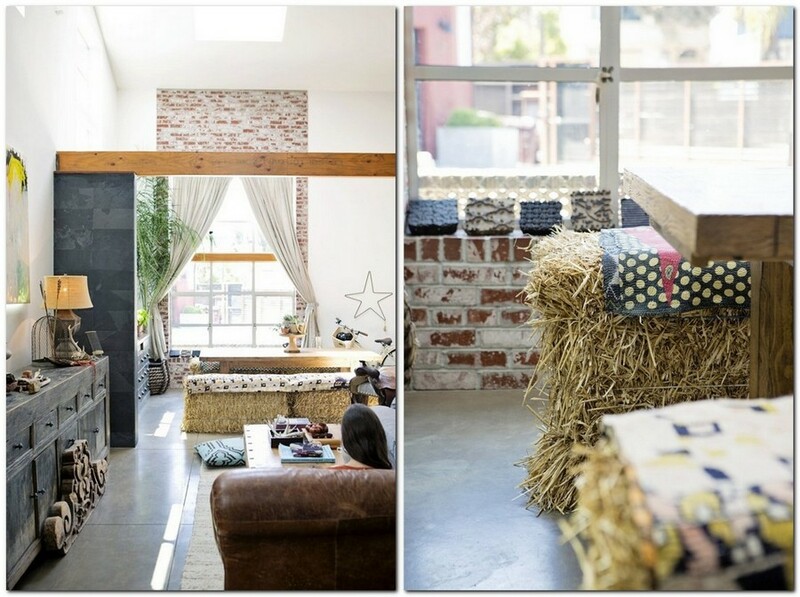 In fact, conventional chairs and benches can be replaced with something unexpected, like… hay stacks, for example! You must have never considered such an option. But this doesn’t mean that it doesn’t have the right to exist. Try it – maybe that’s just what you need!